Position the tractor and backhoe so you can dig up material and place it as far away from the hole as possible. This will also help to limit the number of times the tractor has to be repositioned. Set the tractor’s parking brake and make sure the transmission is placed in the neutral position. Rotate the tractor seat into the backhoe-operating position, lower the stabilizer feet, and remove the transport locking pins. Using the boom and bucket control levers, you can dig on three sides of the stump from a single position and deposit the dug out material to both the left and right sides of the stump. The soil around the stump can sometimes be largely composed of clay material. When this is the case, use the shovel to remove the material that’s right up against the stump’s major roots. This will help to free the stump. You will want to use the chainsaw to cut away some of the larger and deeper roots so the stump will be able to come free. Once the stump is free, it’s time to get it out of the hole. Tighten a ratchet winch strap to the stump by running it under the freed stump and up to and around the backhoe bucket. Then, using the backhoe’s boom lift capacity, lift the stump out of the hole and carry it to an area of the property where it can be disposed of according to local regulations. 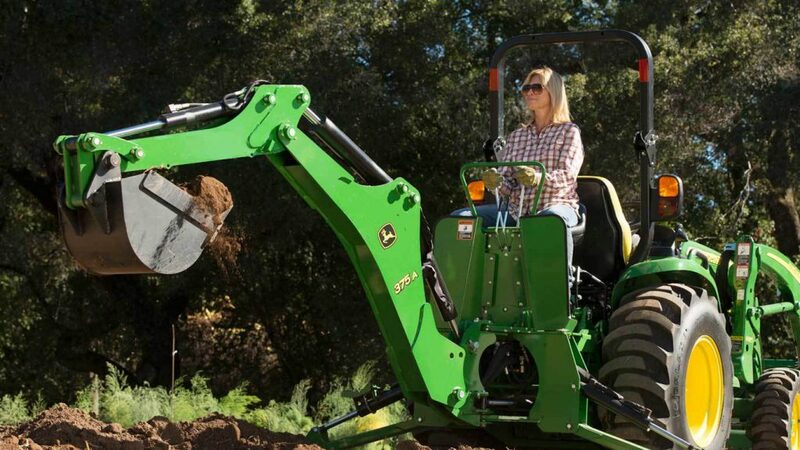 The entire tree stump removal process should take less than three hours with a John Deere tractor and backhoe on your side. For more information and details about the stump removal process, watch the video below or visit the John Deere Tips Notebook website. If you have any additional questions about the tree stump removal process using John Deere equipment, contact your local John Deere dealer.